The Trustrip™ Sample Transfer System (STS) is a smart, efficient, tamper-proof and cost-effectivetechnology for collecting and transporting specific volumes (15 µl - 400 µl) of biological samples (blood, serum, plasma, urine, proteins, antibodies, DNA, bioanalytical reagents, plants, and chemicals) on pre-calibrated strips, without the need for any measuring devices such as a pipette. 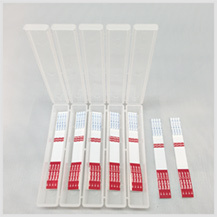 Individual strips containing samples are air dried and stored in a specially designed TruStrip tray for long term storage at room temperature, 4°C, or -20°C. The samples collected on TruStrip™ strips can be easily shipped at room temperature without the use of refrigeration or dry ice, which prevents expensive shipping costs. The dried samples from the strips can be quantitatively recovered by simple immersion and gentle shaking in water, saline, or any special buffer or solvent. 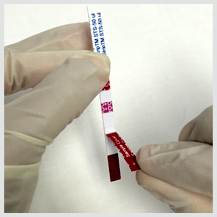 The active sample pad of TruStrip strips could also contains a visual dye stripe that enables tracking of sample load and recovery even if the sample has no color, such as a protein or DNA in colorless buffer or water. Learn more about TruStrip™ STS technology and see how this novel system can help to maximize your research and clinical testing efficiencies, productivity and outcomes!